Celebrating Children in Need 2017 at Cool Milk! We celebrated Children in Need 2017 with a fun filled, action packed day! 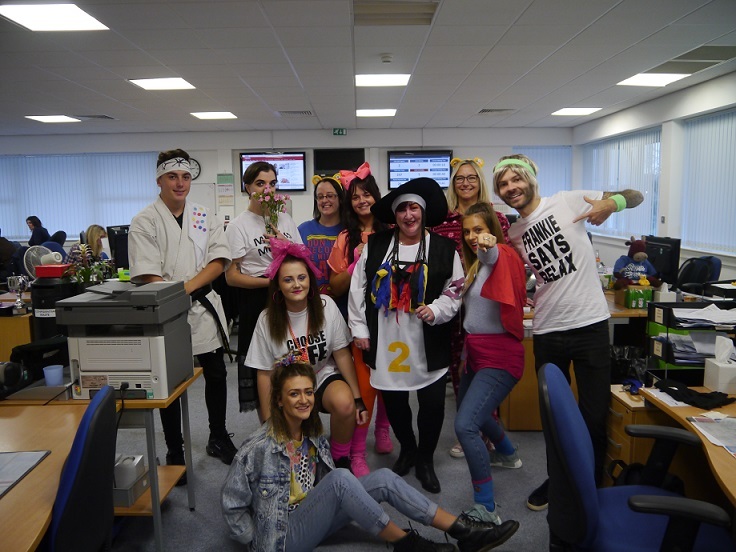 Everyone at Cool Milk dressed up with three different themes to choose from; the 80s, superheroes and pyjamas. The colleague with the best costume won a prize and we donated a little extra to Children In Need on behalf of the runners up. Congratulations to Lisa for her superb Boy George costume, Leon for his Karate Kid outfit and Ollie for his very cosy onesie! We also held a cake competition and bake sale. The competition was judged by our Managing Director. Congratulation to Jess, who won first place with her superhero themed, chocolate fudge cake. At lunchtime there was a charity barbeque which went down very well indeed, even after all those cakes! Children in Need provide grants to projects around the UK which focus on children and young people who are disadvantaged. The charity supports around 2,400 projects all across the UK, helping children improve their lives. Cool Milk is proud to support this charity for another year and we are delighted to announce a total of £154.09 was raised. Thank you to our colleagues for their support and generosity.